It is so hard to accept that this weekend is over! It was just what I needed – a perfect mix of running, time with friends, and relaxation. First, let’s talk running. On my training plan, I had a 3 mile speed workout at goal pace and an 8 mile long run for this weekend. I wasn’t sure if I’d do the 3 mile goal pace run, but when Saturday came around and it was cold and dreary out, I was not feeling the 8 miler, so I ended up pounding out the 3 miles on the treadmill in the afternoon. My goal pace was 9:31 min/mile (6.3 mph) when I started this training plan, but I’ve definitely noticed myself getting faster as a result of the speed work, so on Saturday 6.3 mph was feeling pretty easy, so I upped it to 6.4 mph (9:22 pace) and felt really good for the whole 3 miles. I ended up finishing in 28:10, which is fast for me! I definitely felt like I could keep running at the end, so that was a great way to finish the run. On Sunday, the weather was BEAUTIFUL. It was in the upper 40s, sunny, clear and just perfect for running, so I was kind of excited I ended up waiting until Sunday to do the long run. If you remember from last weekend, my 7 miler ended up having to be on the treadmill, and it was slightly painful. This time, I felt awesome. It’s crazy what a difference there is in training this time versus last time. Last time, I remember feeling so defeated during each and every long run, hoping that one day it would just “click” and not be so hard. It was only during the last long run – the 12 miler – where that happened, and then during the race itself. This time, training has felt GOOD. There have definitely been some runs that are harder than others, but most of the time I’ve physically felt really good during the runs, even if I’ve struggled a little bit mentally. Yesterday’s run was no exception. I pounded out 8 miles, and the only mentally rough part was as I was approaching the 4 mile mark because I did an out and back run, and was getting anxious to get to the turn around point. Otherwise, I was feeling good, strong, and confident during the whole run – such a great feeling! I finished the 8 miles in 1:16:17, which is an average pace of 9:32, which I’m very happy with since I felt really comfortable the whole time. If I can maintain that pace during my half (another 5.1 miles), that will put me at my reach goal, finishing in under 2:06 (cutting 10 minutes off my time from my first half marathon!). Overall, a great weekend for running! Saturday, Katie was in town since her parents live just outside of DC. We have been talking a lot over the last several months over email, phone, and g-chat, but had never met in person until this weekend. We had SUCH a great time! 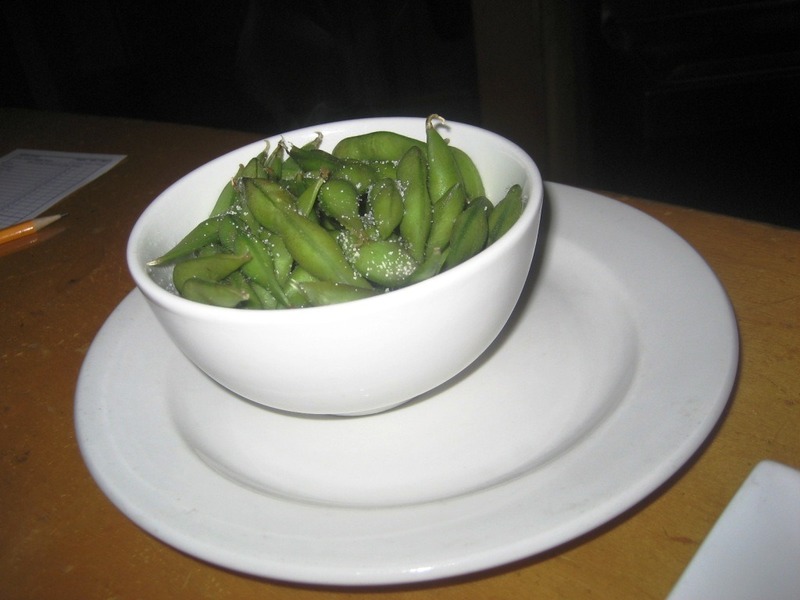 We ended up going to Café Asia in Rosslyn, because they do happy hour even on Saturdays. They have a bunch of appetizers for $3, cheap (but delicious) sushi, plus really reasonable wine, sake, and beer. All these appetizers were just $3 each! 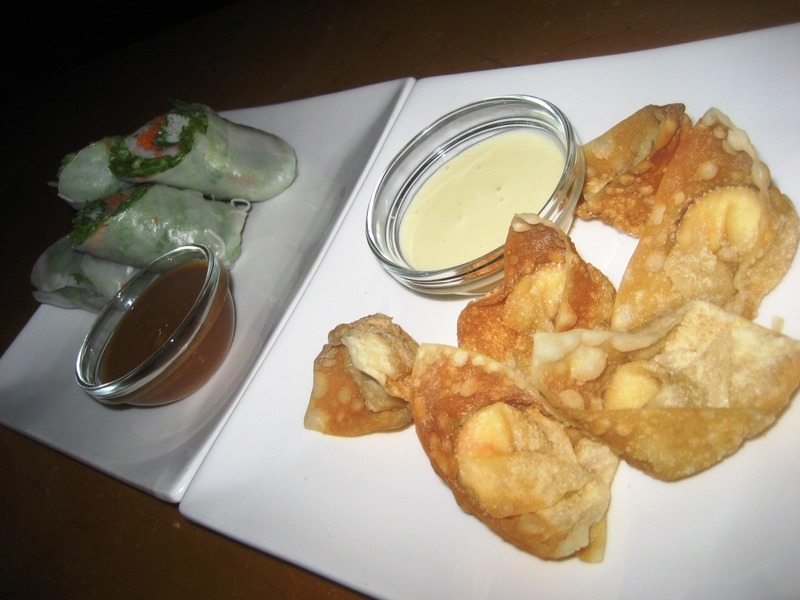 Summer Rolls, Crab Wontons (with this sauce that you would want to bathe in it tastes so good), and edamame. We also got a bunch of sushi but I forgot to take a picture. 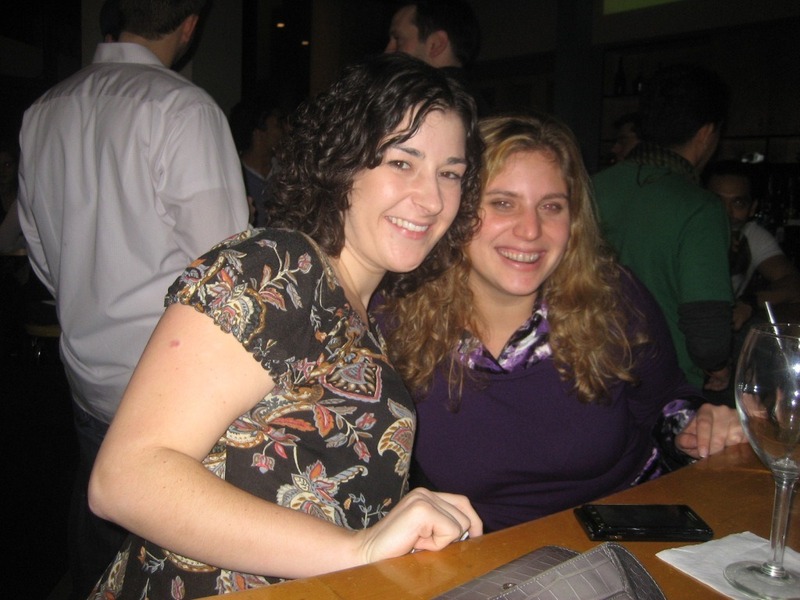 I asked the bartender to take a picture of us, and for some reason he moved over to the side behind the beer taps and got a picture at a really awkward angle (when there was plenty of room to get our photo right in front of where we were sitting). We had a blast and it was just what I needed to unwind and have fun during the weekend! And finally – the relaxation portion of my weekend. There was plenty of that. Friday night, I ended up just coming home, watching a movie, and vegging out for the whole night. Saturday, I slept in (until 10:30! ), and then was busy for most of the rest of the day but it was all fun stuff. Sunday, Wil and I went to church in the morning and they did an awesome message about controlling your anger (over everyday things), and then we went out for lunch at this cute little Vietnamese restaurant – Saigon Saigon. 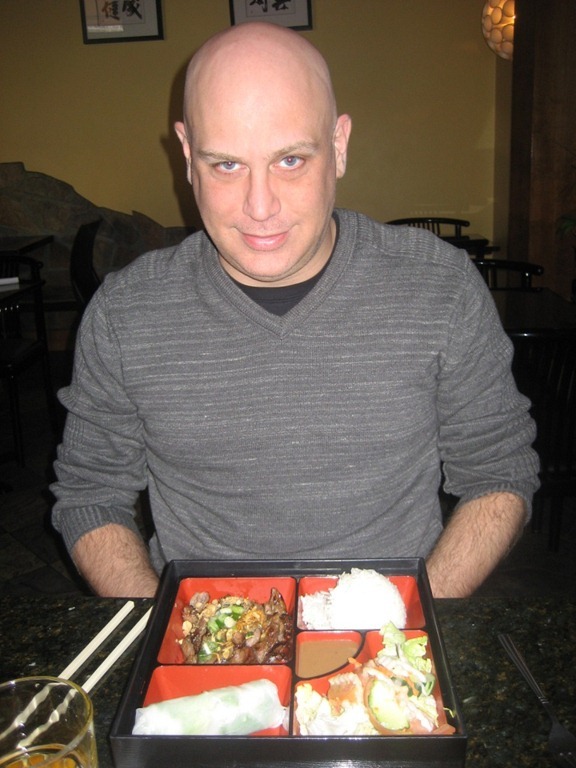 They have this awesome deal for a bento box for lunch for just $8.95, even on Sundays! 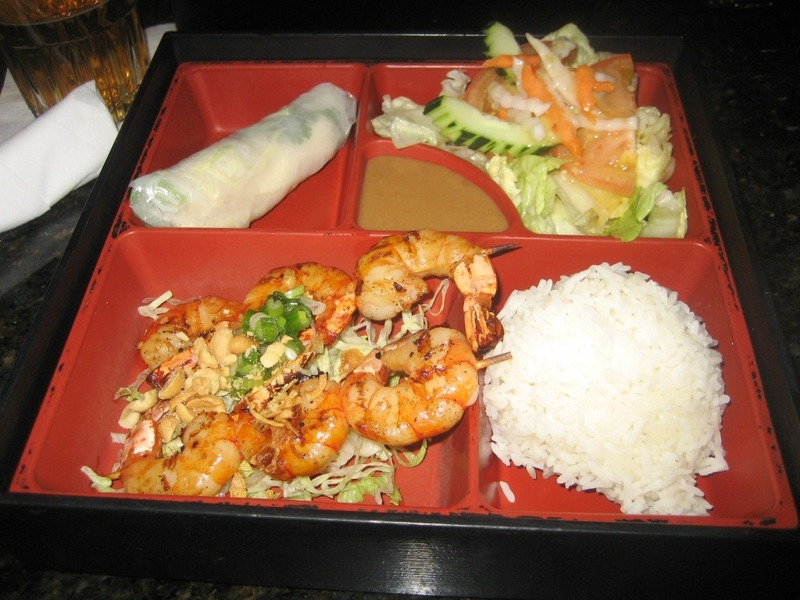 It came with the entrée (I ordered grilled shrimp), steamed rice, house salad, and a spring roll. I asked for a fresh spring roll rather than the fried kind and they gladly replaced it. He got the grilled pork for the entrée and the rest the same as me. All the food was fabulous, and so cheap! We will definitely be frequenting this place on Sundays after church because there also happens to be a Harris Teeter grocery store right there, so we hit it up after lunch to get a few things for the week. Besides my 8 miler, I ended up spending the rest of the day at home and laying low watching the Super Bowl. There were a few parties but we both just decided being lame and staying put sounded more appealing. My weekend was great!!! Favorite part was definitely buying a new car… so exciting! Wow a new car definitely sounds like the highlight to me!! OMG i love Cafe Asia. I have not been there in… I think it’s been five years. Their sushi was (and hopefully still is) incredible. It is still awesome! You should definitely check out happy hours there… they have such great deals! Your runs sound great. Your speed work + consistent training is definitely paying off. Isn’t the worst part of a perfect weekend like that is that they have to end? Yes definitely the worst part is now being back at work! Boo! Running in the afternoon was sooo fun. I left around 2:30pm so the weather was perfect. It’d be nice to do that all the time rather than just on the weekends! How cool! 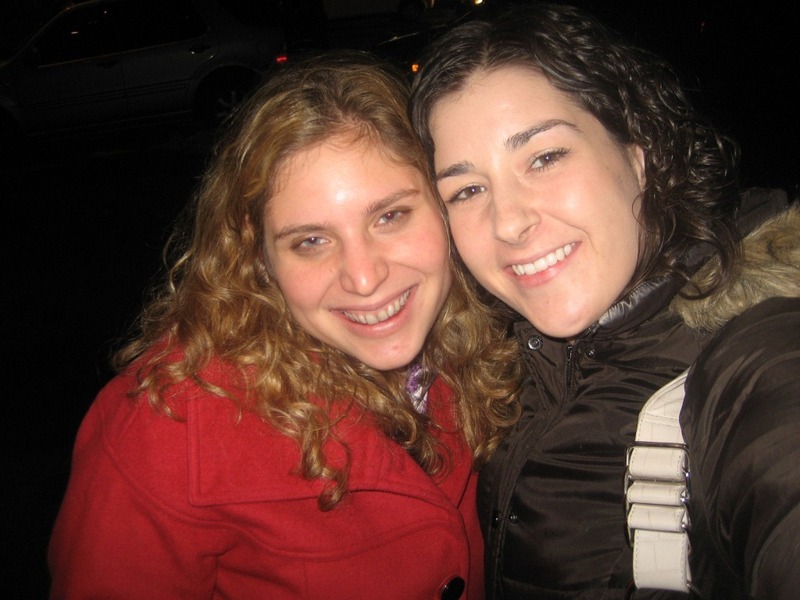 I just found Katie’s blog a few weeks ago… It’s so random that you two got to meet! Also… your boyfriend is too cute! and way to go on the 8 miles! Katie found my blog a while ago and so she reached out to me and we’ve been talking for the last few months. It was fun!! Way to go on your run! 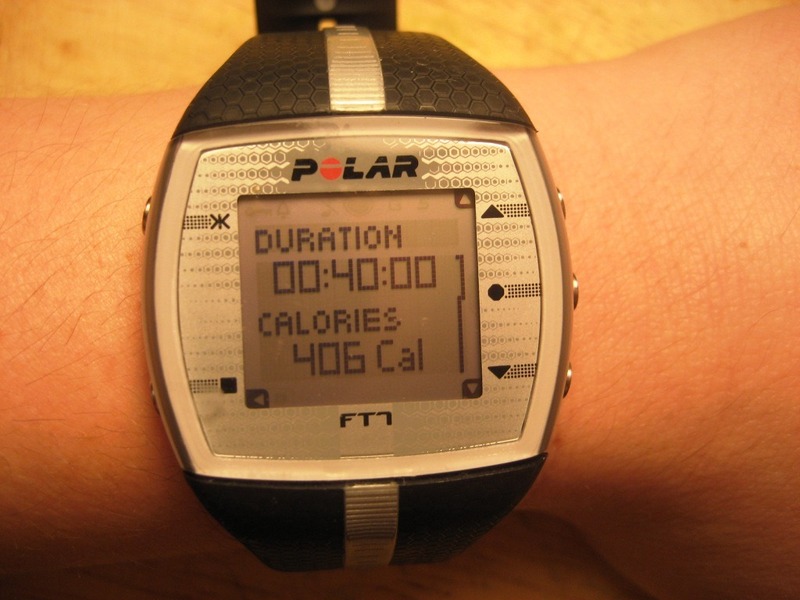 I’m thinking of getting a heart rate monitor of some kind — do you have post about that or your garmin? I’d love to see your reviews. My weekend was good — lots of relaxing but I also got a ton of cleaning/errands done which is always nice! 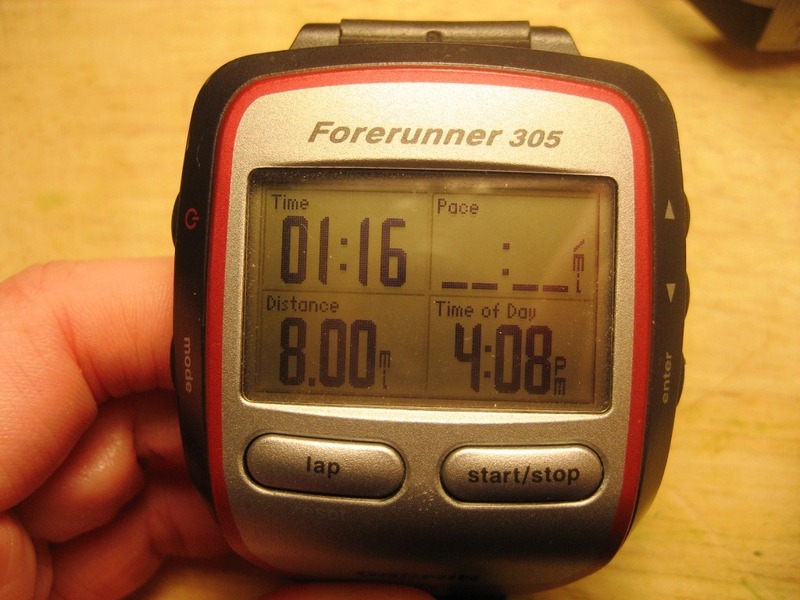 I didn’t do a formal Garmin review, but I love that to.. The thing I like about the Polar above the Garmin is you can use it for any kind of workout, but it doesn’t track mileage. That’s awesome that you were able to save the long run for a nice day! I’m thinking of venturing outside soon… but still waiting for a little more snow to clear off the trails and such… ugh! It was pretty warm in DC this past week so all the snow had melted… I’m hoping it stays this way because running outside feels sooooooo good! Great job on those runs! I’ve never been to Saigon Saigon even though I live right across the street. Your food looks so good, I’m going to have to check out out! Thats an awesome weekend! It was such a perfect day for a run on Sunday, congrats on making the most of it! Nice run! Looks like you had a great weekend. I love super productive weekends with fun activities balanced with down time. That was my weekend too. I had a couple great workouts and was happy with my Taxes…Planning a vacation now! My mountain bike ride was my favourite, albeit tiring, part! That is a perfect weekend! Glad you got to relax! And nice work on your training progress! Your mile time should be great! Great run Beth!! I just bought the same heart rate monitor as you the FT7 and have a question if you don’t mind. 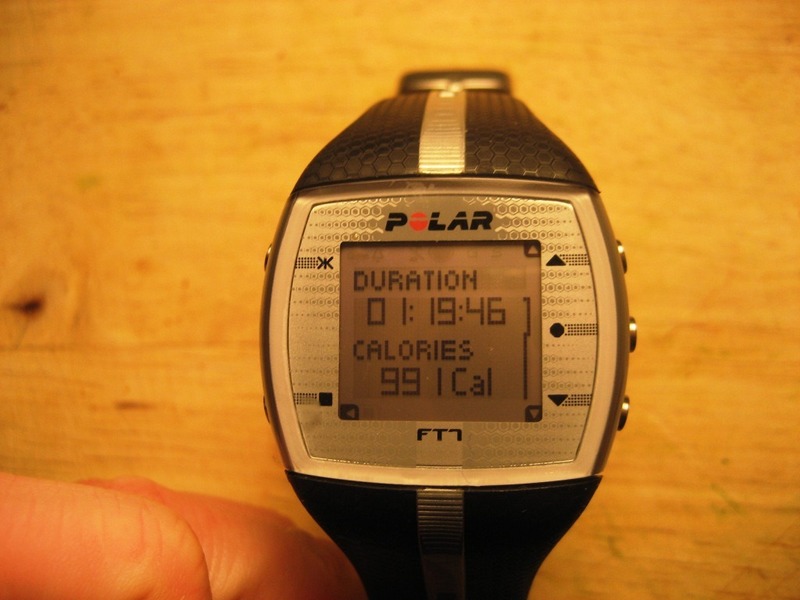 The screen where it says FAT BURN and then a smaller number below, what does that mean? How crazy! I think that is Katie from my daily WW check-in group. Small world! Awww, I love this post!! Saturday was so much fun =) It was awesome to meet you (in person). I was bad–I took a day of leave yesterday to recouperate from the weekend. We should definitely hang out again soon!